When we started developing Empires Apart, we knew we wanted to create the game that we have always wanted to play. We took inspiration from our favourite games, and then we thought: “How can we build on these?”. We started to think on what other cool things we could add, what we could change and what we could improve. 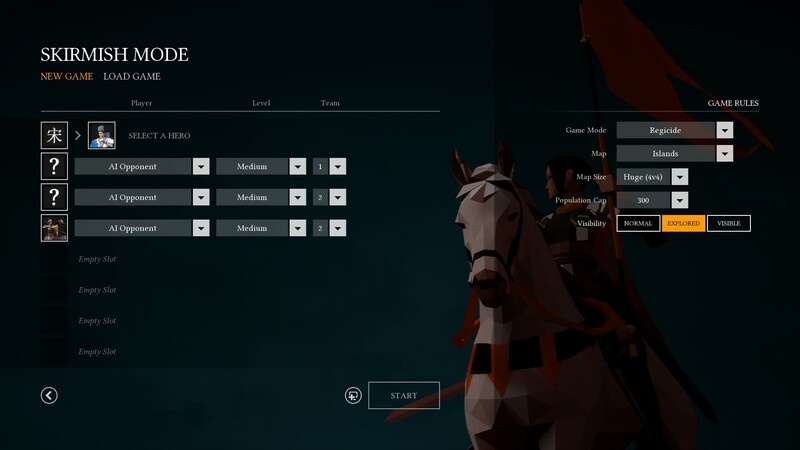 One of our goals with Empires Apart was to add more variety in Game modes. Something we really wanted to do was to provide new ways to play the game. But first it was essential to create a really strong Skirmish mode. Skirmish in Empires Apart offers huge replayability value. Select your Civ, and then the Hero you want to use. Each Civ has Heroes, and each Hero has different strengths and abilities. Then, select the number of Opponents that you would like to face, up to 8. You can, of course, assign them to different Teams or set different Difficulty levels. Then, you can select between eight different map types, as well as 4 different map sizes. You can set a Population cap (100, 200 or 300) and decide on Visibility settings: you can start with a completely explored map and you can even disable the fog of war. What we truly love are the game modes we added for Skirmish. Our main game mode is Conquest. In this mode the objective is to destroy all of your opponents’ Town Centers. If they’re not able to rebuild a Town Center within the time limit, you win the game. This was done to give you a clear objective even in “normal” games and shorten the length of games. No more pesky villagers hidden in the corners of the map! The next mode you can play is Assassination. Every player starts with their chosen Hero, and the goal is to kill all the other enemy heroes. Use all the means at your disposal to eliminate them! Then you can play Diplomacy. During the course of a game, you can send Alliance offers to other players. Should they accept, you will then be allied, your units won’t fight each other, and you can win the game together. But be careful, they might decide to break the alliance and betray you at any moment! It gets even better in Assassination with Diplomacy. You need to kill enemy Heroes to win, and you can forge alliances with other factions. Expect lots of intrigue, ambushes and backstabbing. We also added a completely different way to play the game. Survival. In Survival the goal is to survive as long as you can. By day you will be looking to boost your economy, expand with new buildings, recruit new units… because at night you will be attacked by an ever increasing number of enemies. These can be from any Civ and will attack from all directions. The longer you survive, the harder it gets. There is also another mode that you can play in Empires Apart: Challenges. Every Civilization has a number of Challenges you can test yourself with. They are situations designed so that they require both problem solving and mechanical skill in order to be completed. They are a great way to learn and master the gameplay mechanics specific to every civilization. [quote="AlbertoC"]When we started developing Empires Apart, we knew we wanted to create the game that we have always wanted to play.